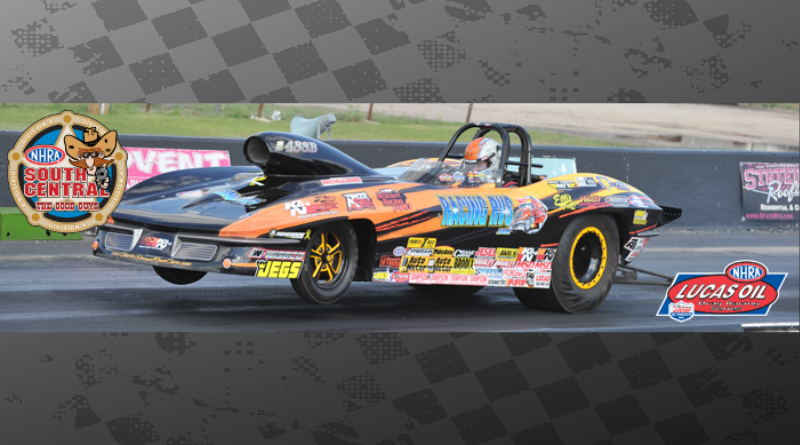 NOBLE, Okla.,– In the final results from Thunder Valley Raceway Park and the NHRA Lucas Oil Drag Racing Series, Jeff Lopez, Irving, Texas, claimed titles in both Super Gas and Stock Eliminator. Lopez faced off against Jay Bunce, Piedmont, Okla., in Super Gas and posted a winning run of 6.315 seconds, 124.06 mph in his ’63 Corvette. Bunce drove to a 6.344 second, 127.98 mph lap for a close runner up finish. In his second final of the day Lopez, worked his way through the Stock Eliminator field and ran 5.869 seconds at 116.64 mph in his victory over Greg Stanfield, Bossier City, La., who clocked in at 6.627 seconds, 99.32 mph. This was Lopez’s 15th and 16th Lucas Oil Series victories. Koy Collier took home the win this weekend in Super Comp. Collier, Benton, La., drove to a pass of 5.700 seconds at 131.61 mph against Christopher Dodd, Double Oak, Texas, who had an impressive runner up finish of 5.706 seconds at 146.65 mph. This was Collier’s third Lucas Oil Drag Racing win. Other racers visiting the winner’s circle this weekend were Greg Kamplain, Brownsburg, Ind., in Comp Eliminator; Vic Penrod, Walters, Okla., in Super Stock; and Cy Hill, Lubbock, Texas, in Super Street. In the division’s SDPC Raceshop Top Sportsman class it was Monte Weaver, Lubbock, Texas, taking the win while Greg Gallagher, Deltona, Fla., won in SDPC Raceshop Top Dragster. Robert Sander, Cypress, Texas, claimed victory in Sportsman Motorcycle. This concludes the South-Central Division’s season for the NHRA Lucas Oil Drag Racing Series.